James Aubrey Hinshaw1,3 [James A. Henshaw4,5, Aubrey Hinshaw6,7]. Johnnie M. Sands Hinshaw, 83, of Eureka went to be with her Lord Tuesday, Oct. 2, 2001. Graveside services will be 10 a.m. Thursday at Eureka Cemetery with Tony Neal, pastor of Mildred Baptist Church, officiating. Mrs. Hinshaw was born Nov. 23, 1917 in Waldo, Ark. to Joseph Anderson and Annie Bussey Sands. She married James Aubrey Hinshaw in 1936. She was a member of Mildred Baptist Church. She was preceded in death by her husband in 1972. Mrs. Hinshaw is survived by her daughters and sons-in-law, Joanne and Bunk Bottoms of Eureka and Kay and Dennis Donaho of Mildred; son and daughter-in-law, Kenneth and Denise Hinshaw of Corsicana; seven grandchildren; sisters, Frances Hart of Kirkwood, Mo. and Ruth Nix of Magnolia, Ark. ; and brothers, Ralph Sands of Kirkwood, Mo. and Tommy Sands of Magnolia, Ark. Donations may be made to Mildred Baptist Church Building Fund. Obituary of Johnnie M. Sands Hinshaw. Contribution from Rex () citing: Sam Nix. 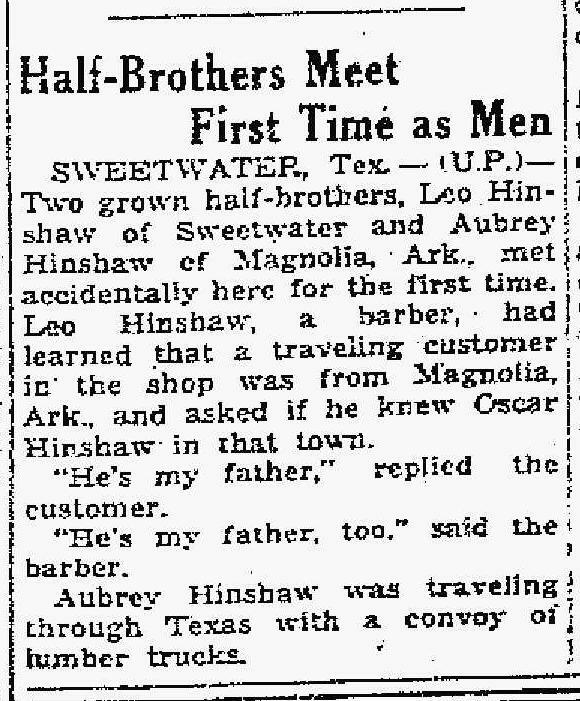 "The Hammond Times", Aug 23 1940; http://www.ancestry.com. RootsWeb WorldConnect data by Rex Sands ().